You can use adaptive models to predict customer behavior by calculating the propensity of customers to accept a proposition, respond to a message, click a web banner, and so on. Because the models are self-learning predictive models, their predictive performance improves with every customer interaction; for example, when a customer accepts an offer, the next version of the model uses that information to provide better predictions. The propensity values that an adaptive model returns facilitate offer prioritization, which ensures that the next best action is relevant and personalized. You can monitor the models to check their predictive performance, to obtain insight into how they work and which predictors they use, and to learn how these factors correlate to the outcome. 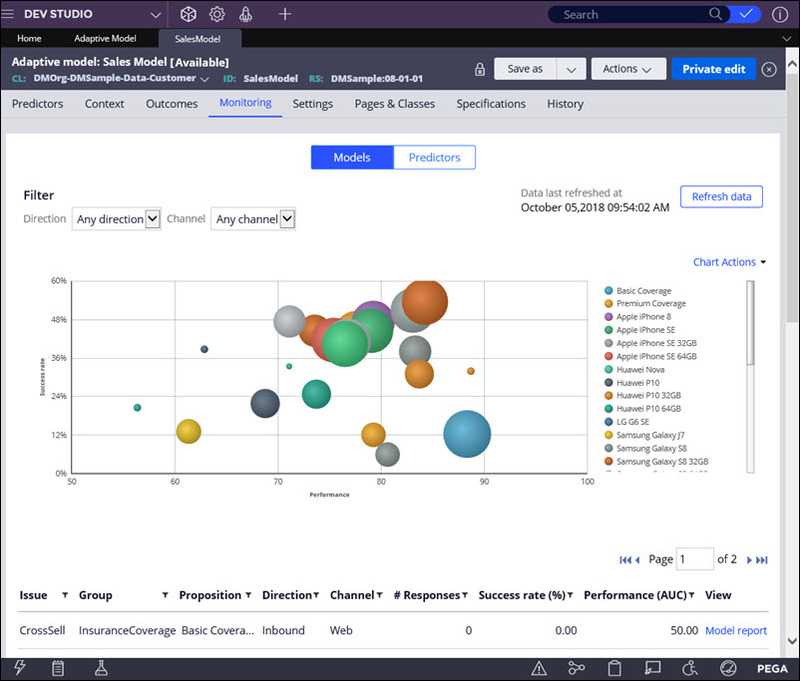 In Pega Platform™, use Prediction Studio and the standard reports in the Report Browser to better understand adaptive models and monitor their performance. In the bubble chart, each circle represents one model instance for a specific proposition. The size of a circle represents the number of responses (positive and negative). The Performance axis indicates the accuracy of the outcome prediction. The model performance is expressed in area under the curve (AUC), which has a range between 50 and 100. High AUC means that the model is good at predicting the outcome, while low AUC means that the outcome predictions are not accurate. The Success rate axis indicates the number of positive responses divided by the total number of responses (in percentages). By hovering over a circle, you can view the model performance (AUC), the success rate, and the number of responses. In the Models overview tab, look for adaptive models with a success rate of zero. This means that the propositions for these models do not have any positive responses. In the Models overview tab, look for adaptive models with low performance; these are the models in the left side of the chart. Review the reports for these models and consider adding additional data as predictors. For more information, see Predictors. In the Models overview tab, look for adaptive models with a low number of responses; these models are represented by the small circles in the chart. Investigate the eligibility criteria in the decision strategy and change exclusion settings to increase the proposition frequency. For more information, see the component categories in Completing the Strategy tab. In the Models overview tab, look for adaptive models with a high number of responses; these models are represented by the big circles in the chart. A high number of responses might be fine from the business point of view. However, if necessary, you can adjust prioritization in the decision strategy to decrease the proposition frequency. For more information, see Strategy components - Arbitration. Open the Model report to inspect your model after introducing a new proposition, adding or removing a predictor, or changing prioritization in a decision strategy. In the Model report, you can view the active and inactive predictors, investigate the top predictors, or check the uplift among the top-scoring customers. For more information, see Adaptive Model, Proposition Management landing page, and Completing the Strategy tab. Check the details of a predictor with a low performance score. A possible cause can be too many missing values for the predictor. Look at the top predictors and in the bins that have a particularly high or low success rate. To inspect a predictor, open the Model report. In the Predictors tab, look for predictors that are never used by any model. Because unused predictors have only a minor effect on model performance, you do not need to remove them from an adaptive model configuration; however, you can conduct an occasional cleanup as part of your maintenance activities. An unused predictor might still become relevant for a future proposition. For more information, see Predictors. Check the performance of your models every two weeks. Check the success rate of your models every two weeks.